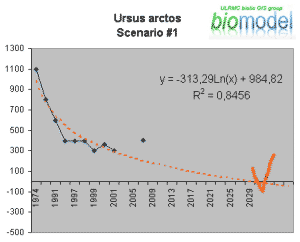 Ursus arctos L.: natural habitat changes and accidental GSF-response by settlements based on open Internet sources, GSF software and RS- and GIS-analyze (1970, 2007). GSF is an additional searchable test-program made in ULRMC for the project purposes , and which used available Internet sources. 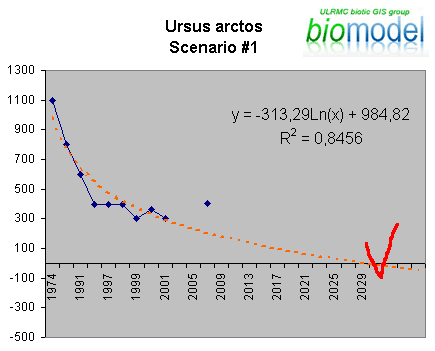 GSF calculates number of causes, when Latin names of selected species were connected with a GIS-name of a settlement plus a year (for a concrete territory): ‘Ursus arctos 2007’, Ursus arctos 1970’ etc. A basic authors’ hypothesis was that series of respective settlements may adjoin ‘natural’ or ‘past-natural’ habitats of the species or respective species migratory areas. There were 20891 settlement names in the GSF-GIS test and that was overlapped with modeled U.arctos natural habitat based on RS data and special GIS analyze . The map in GIS showed that during 1970-2007 number of cases of the responses increased (against a background of slowly destroyed original habitats!) Authors suppose that it is not only result of increasing of awareness of local people or mass media, but also result of the species movement, and which populations have requires larger area, or the result of changes of the environment on a global level. Note: (+) means presence, (-) – absence of GSF response. GLM scenario demonstrated habitats erosion and ‘NE, SE’ trend of the species by 2050. Supportive logarithmic approximation (Scenario #1, ‘pessimistic’, see diagram) shows that U.arctos population in Ukrainian part of Carpathian Mtg Region is not sustainable till the time. The GLM demonstrated that new natural habitats will appear by 2050, but detailed GIS modelling proved that fragmentation of the habitats have prevent probable migration of the species to that new habitats in outskirts. If society will do nothing with management and sustainability of natural habitats of the species it can live the area in 2030s (Scenario #1). Sources: Prydatko V., Kolomytsev G. et al. Brown Bear (Ursus arctos L.). Scenario 1 and 2/Landscape Ecology: Textbook on Application of Pressure Based Biodiversity Modelling for National and Regional Educational Purposes” Part 1.—Kyiv: NAU, 2008.—pp.38-40. NB: the model reflects ‘convenience’ of the habitats, for example, in Crimea since disappearance of the species here in XVII c. (Makarov, 1947).